Why do we Need Positive Organisational Scholarship? Scholarly research into organisations goes back into the 19th Century. And from the mid-20th Century on, it has been a major pre-occupation of business schools and their academic staff. This blog is filled with contributions from many of the great management thinkers. So, what was new in 2003, when Kim Cameron, Jane Dutton, and Robert Quinn led the charge? The answer is the rise and rise of the Positive Psychology movement, whose leaders included Martin Seligman, Barbara Fredrickson, and Mihaly Czikszentmihalyi. The time was ripe to expand Positive Psychology from the personal to the organisational level. What is Positive Organisational Scholarship? 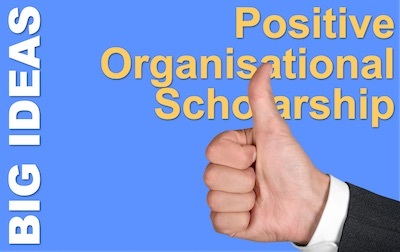 Positive Organisational Scholarship (POS) applies the same basic philosophy to studying what makes organisations work. That is not to say that POS does not pay any attention to things that don’t work, and to dysfunctional behaviours. Rather, practitioners aim to correct them by overwriting the behaviours with positive ones. At the same time, we celebrate ‘positive deviance’ – the exceptional performances, and try to embed them into everyday organisational practices. As an introduction to the field, let me describe my understanding of my favourite concepts that are important areas of research and application. Each of these contributes to allowing an organisation to flourish. In flourishing organisations, there is a strong bias towards learning people’s strengths and finding ways to harness them. When we apply our strengths at work, we gain maximum satisfaction. They underpin our experience at work, because they are pretty much hard-wired into us. When we learn new skills that play to our strengths, we acquire talents, and we feel a drive to practise and develop them further. Organisations tend not to like deviance from a norm. And the norm represents the organisation’s ‘average’ or its ‘okay’. And that makes sense when you think about negative deviance that represents under-performance or damaging behaviour. But, at the other end of the spectrum is ‘positive deviance’. The unintended consequence of eliminating deviance is that this is suppressed. But here lie the seeds for growth and development. Flourishing organisations encourage examples of positive deviance, and seek to embed these new practices into a refined norm. We have choices how we deal with people. And most managers default to making the default choices. They want to reinforce the rules, policies, and norms. But, in a flourishing organisation, leaders make consistently virtuous choices that they calculate to benefit people. The culture needs to make this possible and encourage it. But systematic virtuousness results in happy workers who do not fear mindless rules. The cost of a team member leaving early because their child has a concert is more than repaid by their wellbeing and gratitude. Listen to any organisational meeting and you’ll hear comments that are both positive and negative. Supportive and antagonistic. Affirmative or denying of other people’s points of view, ideas, and contributions. The positive emotional states in individuals, which an affirmative bias can create, will help an organisation to flourish as a whole. Although it suffers from the chronic problem of much social science research, a 2004 paper by Marcial Losada and Emily Heaphy found that a 5:1 ratio of positive to negative comments can transform the feel of an organisation’s culture. Being with some people can make us feel great. They show positive deviance, virtuous practices, and an affirmative bias. When a few people reinforce one another, they become a Positive Energy Network. They set high goals (that Cameron refers to as ‘Everest Goals’) and communicate supportively to form high-quality workplace relationships. And people will take on tasks they would prefer to not do, and work harder, just to become and stay part of a Positive Energy Network. What is Your experience of Positive Organisational Scholarship?